After my last morose post, I went out with the Striders on Wednesday evening. It was just what I needed. I ended up with a slightly faster pace group than I had intended, but that was no bad thing, and I ran over routes I had not seen for months. I was the slowest of my group, but acquitted myself honourably. 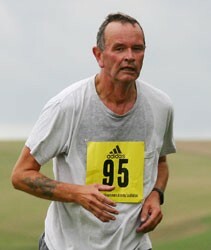 Best of all, I found out about a race in Alfriston on Saturday, so I shall manage an August race after all. I last posted here over a month ago. If regular readers feared I had lost the use of my legs, let me reassure you. But my running has been poor and difficult. I've attempted nothing more than six miles and even short three-milers are hard work. My legs hurt and I feel very tired. Part of this may be the effects of some anti-histamines I've been taking. I've stopped now and this evening will go out with the Seaford Striders. In the longer term it looks as if lucnhtime running at work may be back on the agenda. I have no race scheduled until the Brighton 10K in November, though I want to do the Lewes Downland 10.